"Klymshyn not only understands this great profession, he relates the passion and fun of managing sales people in this wonderful guide. We have waited for this for some time." "This book reminds us that we can never invest enough time and effort to reward and recognize the sales effort of our team. I think the importance of this is shared in this book and, if followed, can only lead to a strong and successful sales culture in any organization." "In thirty-two years of selling and managing the sales process, I found The Ultimate Sales Managers' Guide to be the most complete collection of sales truths. It goes beyond the simple clichés to the heart of the issue, which is what drives and motivates the successful sales mind." "Klymshyn not only throws the challenge out there to sales managers to be the 'ultimate sales manager,' he shows us how to get there, step by step." "Outstanding! 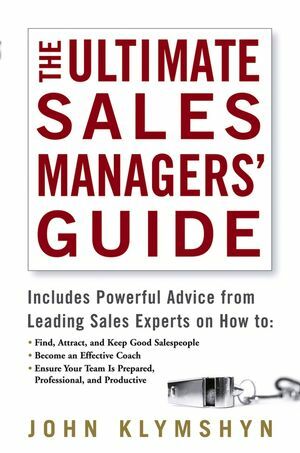 This book is a bible for sales managers. It provides a foundation for anyone to build a winning team." JOHN KLYMSHYN has been a professional speaker for more than eighteen years. He is the founder and President of The Business Generator, Inc., a management, sales, and communications training and coaching firm. Part I Finding, Keeping, and Releasing Salespeople. 4 THE THREE-TIERED SALES TEAM. 6 WHEN TO FIRE A SALESPERSON. 8 ONE-ON-ONE MEETINGS—FIFTEEN MINUTES OF FAME. Part III Planning and Preparation. 9 GOALS LEAD TO GREATNESS. 10 THE THREE-STEP BUSINESS PLAN. Part IV Skills All Salespeople Should Have. 14 CLOSING TECHNIQUES ALL SALESPEOPLE SHOULD KNOW. APPENDIX A: A BRIEF DISCUSSION OF ATTRIBUTES 39 THROUGH 52. APPENDIX B: 52 ATTRIBUTES OF THE ULTIMATE SALES MANAGER.